Pentax has produced some excellent DSLRs like the Pentax K-7 and Pentax K-M, but not everyone wants to invest in a camera with interchangeable lenses. The X90 is a bridge camera with an integrated 26x optical zoom, it bucks the trend for black livery with a gunmetal grey makeover. The X90 offers 12.1 megapixel stills and HD 1280x720 pixels video at a frame rate of 30fps. With a focal range equivalent to 26-676mm the 26x optical zoom, competes with the Nikon P100 and Kodak Z981, but the Pentax is more compact and feels more manageable. With noticeable plastic construction the X90 feels well made. The rechargeable lithium ion battery is housed in the base of its grip and rubber padding at front and back ensure that it doesn't slip from your grasp when shooting handheld. If we take issue with its design it's that the eye relief for the electronic viewfinder at the back juts out a little too far, making it tricky to use if wearing glasses of any description. A better bet therefore is reliance on the 2.7-inch, 230k dot resolution LCD monitor below. The X90's top plate shooting dial once again runs the gamut of creative options in program, aperture priority, shutter priority plus manual – alongside the point and shoot Auto Picture mode, which compares scenes against eight on-board presets for common subjects. Mostly reliable, it's occasionally wrong-footed by busy scenes. Built-in digital effects filters including Toy Camera and Retro feel. Saving time up front, here these are applied to pre-captured images, rather than as the shutter is fired. 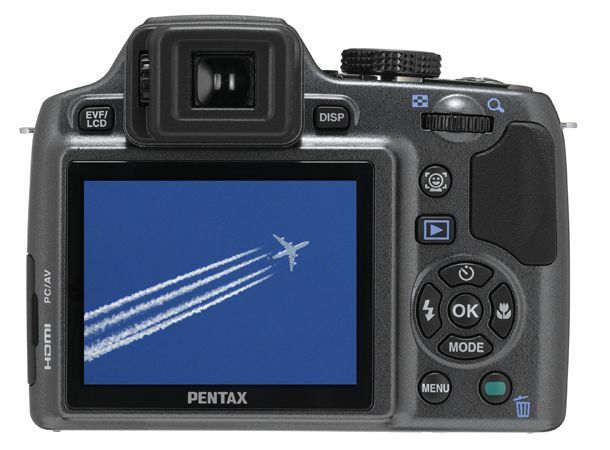 Powering up in just over a second, Pentax has included an 'Intelligent Zoom' function. This runs on from the end of the optical range when keeping a forefinger on the zoom lever, incrementally boosting telephoto performance to either a 33.9x equivalent at 7 megapixels or mind-blowing 162.5x with the compromise of a fuzzy 640x480 pixels resolution. The lower resolutions are because the camera is effectively cropping the image to make it appear as if it has zoomed in. There are three levels of JPEG compression but no Raw shooting on the Pentax and also the zoom cannot be used when filming video, which feels wasteful. The zoom is however effectively supported by sensor shifting anti shake to combat blur when taking pictures in low light – though noise is instead a problem above ISO1600 – or at the extremity of its focal length. Though a smaller more portable option than the likes of Fuji's HS10, the Pentax X90 is still a solid performer, capable of taking good-quality images, and with an intuitive layout that won't scare off novices looking to upgrade from a compact.